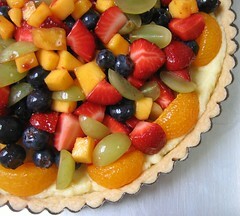 I usually get requests for fruit tarts around Father’s Day. The most likely reason is the abundance of berries and other summertime fruits. I was pressed for time so my search for good fruit was limited to my nearby Mollie Stone’s market. The stone fruits were not quite ripe but they did have some ripe strawberries, blueberries and mangos. I normally add some kiwi for a splash of green but they were out. I got some Thompson green grapes instead. I decided to try a new-to-me recipe for the tart dough. Instead of using the cutting-in method normally used for flaky pie dough, I wanted to try the blending method. The butter is creamed until soft and lump free and then the sugar is added and blended into the butter. The butter and sugar are not creamed together from the start because that would create too much air. 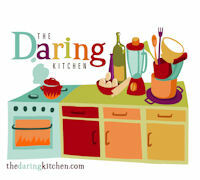 Air is good for cookies and cakes but not so good for a tart dough. Then the flour is mixed in and ice water is added until the flour is just moistened. The dough needs to rest in the refrigerator just like you would do when cutting in. Sugar is a tenderizer so the dough can be a bit difficult to roll out. It was easier to just press the dough into my tart pans. The recipe made enough dough to line one 10-inch tart pan and six 3-inch tartlet pans. I made a vanilla pastry cream to fill my tarts. As an experiment, I mixed in 3 tablespoons of Nutella into 1/3 cup of pastry cream to make one chocolate tartlet for my chocolate loving nephew. Overall, I was very happy with the results. The crust was buttery, slightly sweet and crisp, almost like a cookie. And because of the sugar, the crust was tender but still sturdy enough to hold the fruit and pastry cream without getting soggy. I think I’ve found my new recipe for tart dough. ½ lb (2 sticks) unsalted butter, at room temp. In the bowl of a stand mixer, cream the butter until smooth and light in color, about 2 minutes on medium speed. Add the sugar, vanilla and salt and beat for another 2 minutes. On low speed, add the flour. Mix in just enough cold water to moisten the flour and the mixture forms pea-sized bits. Form dough into a disk and let rest in the refrigerator for 1 hour. On a lightly floured surface, roll out dough to 1/8 inch thickness and line your tart pan. Alternatively, press dough into pan. Freeze or refrigerate lined tart pans until dough is firm, 10-20 minutes. Bake in a preheated 350 oven for 15 to 30 minutes depending on the size of your pan. If the dough bubbles while baking, pierce the bubble with a fork. Allow to cool completely in pan before filling. That's a very interesting method for tart dough. 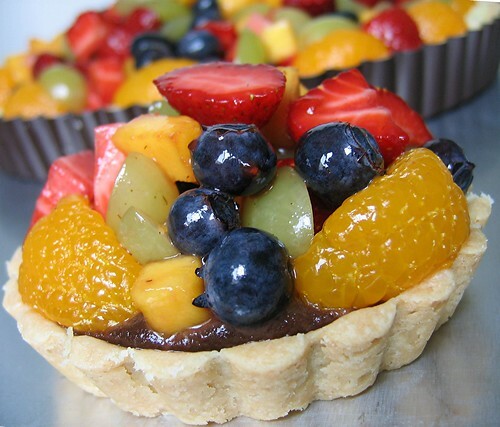 I always have trouble making pies and tarts, so I'm going to give this recipe a try next time. And just out of curiousity (and my addiction to Nutella), how did the Nutella-cream tart turn out? I am a professional food critic and chef, and to my eyes and taste buds, this tart dough was simply incredible. It develops a flaky melt in your mouth taste when cooked right. I love this recipe and hope one day I will get to review a restaurant with such delicious tarts as the ones that I made from this dough. Also, Great approach to making the dough, it was simply different and fascinating.